The United States lies within the central portion of the continent of North America, with the territory of Alaska in northwestern North America. The United States lies within the central portion of the continent of North America. The United States lies within the central portion of the continent of North America, and it is a federal republic comprising of 50 states. The US also comprises of Washington D.C, which is the capital city, five major self-governing territories, and several possessions. The US has a surface area of 3.8 million square miles, and the population was estimated at 325,365,189 in 2017. The United States was founded by the 13 colonies that were under British rule and gained independence in 1776. The 13 colonies included New York province, New Hampshire province, Massachusetts Bay province, New Jersey province, Rhode Island colony, Connecticut colony, Delaware colony, Carolina province, Georgia province, Maryland province, Virginia Dominion and colony, Pennsylvania province, and the divided provinces of North and South Carolina. The federal district together with 48 states are adjoining and are located in North America while Hawaii is composed of different Islands located in the Pacific Ocean, and the state of Alaska is situated in the North-western region of North America. Alaska is the biggest state with an area of 663,268 square miles. The US has 16 territories in total, but only five have permanent residents, and the rest are uninhabited. The territories include Puerto Rico, Palmyra Atoll, Jarvis Island, the Northern Mariana Islands, Midway Atoll, Bajo Nuevo Bank, the US Virgin Islands, Serranilla Bank, American Samoa, Baker Island, Guam, Johnston Atoll, Howland Island, Kingman Reef, Wake Island, and Navassa Island. The US has a mixed economy which ranks first in the world in terms of nominal GDP and comes second in PPP. The US uses the US dollar as their currency, and it is widely used globally as standard currency in international markets. The US has the second highest total estimated value of natural resources which support its economy. The United States ranks third in the global production of natural gas and oil, and it is the leader in airplane manufacturing. 134 of the world’s 500 largest industries have their headquarters in the US. Major industries in the US include automobiles, petroleum, steel, aerospace, construction machinery, electronics, chemicals, telecommunications, mining, and lumber. The US has the highest income gap between the rich and the poor among developed countries. The US is a member of the G-7 nations, and it is one of the countries that invest heavily in research. The largest stock exchange in the world is the New York Stock Exchange, based on the value of its listed company’s securities. 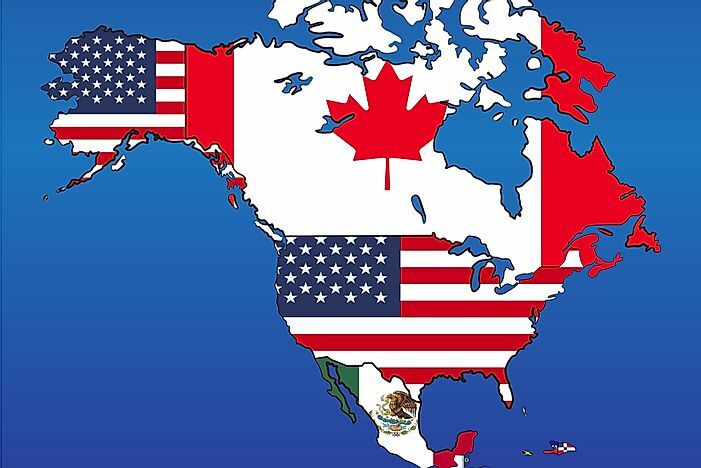 North America is located in the North-western hemisphere, and it is at times considered a subcontinent of the Americas. The continent has an area of 9,540,000 square miles which covers 4.8% of Earth’s landmass. Saint Pierre and Miquelon, Canada, Greenland, Bermuda, and the United States make up North America. The continent is the third biggest in the world by area after Asia and Africa. The Americas are named after Amerigo Vespucci, an Italian explorer who explored South America between 1497 and 1502. The Isthmus of Panama connects North America to South America. In 2016, North America’s GDP per capita stood at $41,830, making it the wealthiest continent in the world. Is The United States A Country or a Continent?